Sergei Bobrovsky made 54 saves, Matt Calvert scored the winner 12:22 into overtime and the Columbus Blue Jackets overcame two goals from Alex Ovechkin beat the Washington Capitals 5-4 in Game 2 on Sunday night to take a 2-0 lead in their first-round playoff series. 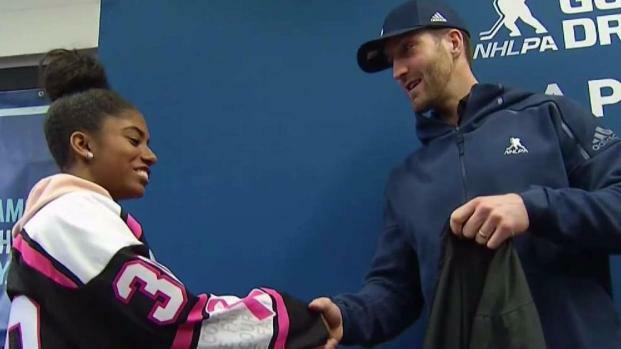 Washington Capitals defenseman Brooks Orpik presented a youth hockey team with new equipment after a fire at its home rink destroyed its old equipment. News4 Sports' Sherree Burruss went to the big reveal. NOTES: Columbus improved to 4-1 all-time in playoff overtime games. ... Linesman Steve Barton had to be helped off the ice late in the first period after clipping skates with Anderson and going down clutching his left knee. On site as the standby official, mid-amateur golfer/referee Garrett Rank replaced Barton as the second linesman. ... Columbus C Alexander Wennberg was out after taking a hit to the head from Wilson in Game 1. Coach John Tortorella only called Wennberg ``day-to-day'' with an upper-body injury. Sonny Milano played his second career playoff game in replacing Wennberg. ... Beagle returning after missing four games with an upper-body injury, Capitals F Jakub Vrana was a healthy scratch after recording an assist and committing two turnovers in 6:58 of ice time in Game 1. ... Commissioner Gary Bettman was in attendance.